Community Case Management Services Limited (CCMS) is a leading provider of Case Management Services, treating Speech & Language Therapy, Neuro Occupational Therapy and Neuro Physiotherapy, providing and arranging rehabilitation for severely injured adults and children. CCMS specialises in providing quality-of-life solutions for a wide range of service users who have suffered catastrophic and complex injuries, ranging from acquired brain injury, spinal injury to loss of limb. 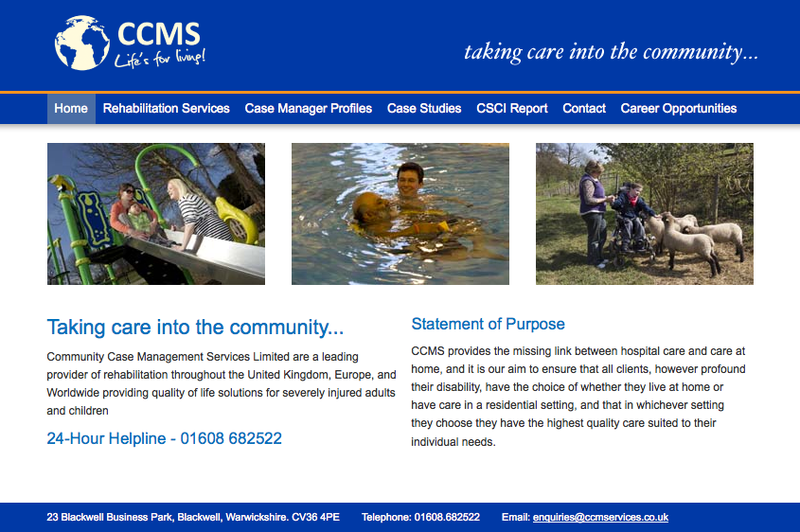 CCMS ensures that clients are given the opportunity to live their lives to the full. Case Management Services can be provided throughout the UK, Southern Ireland and mainland Europe (particularly Poland, France, Denmark, Greece and Italy) Hong Kong and Australia. Several of our case managers are fluent in two or three languages, including Hindi, Mirpuri, Punjabi and Urdu, which is of great benefit with non-English speaking clients and can remove the need for additional translation services which can be very costly. We have developed networks of treating therapists in a number of countries. Quality of life for both children and adults is extremely important to us and we organise structured activities both within and outside the home, even for the most profoundly disabled clients on ventilation. CCMS has BS EN ISO 9001 Certification (Quality Management Systems). I support Shipston Home Nursing because I believe that everyone should have the chance to be cared for at home in the last weeks of their life, irrespective of funding issues.